The Murray Darling Basin Plan will be a strategic plan for the integrated and sustainable management of water resources in the Murray–Darling Basin. The Basin is under enormous stress as a result of past water-allocation decisions, prolonged drought, natural climate variability and emerging climate change. A lack of water and the absence of natural flooding are having a significant impact on many key environmental assets - rivers, streams, wetlands, forests, floodplains and billabongs. The Basin Plan will be developed to manage water resources and ensure there is sufficient water available to make sure key environmental assets and functions of the Basin are not compromised, while seeking to optimise social and economic outcomes. The Murray–Darling Basin Authority (MDBA) is preparing the plan, as required by the Water Act 2007. The plan is being prepared in consultation with the Basin state and communities. It is scheduled to be released for extensive consultation in 2010. You can see information on how you can be involved through our stakeholder engagement strategy here. Provide an integrated approach to managing the water resources of the Murray–Darling Basin in a way that can be sustained through time and in the national interest. Provide a framework for setting environmentally sustainable limits (known as sustainable diversion limits) on the amount of surface water and groundwater that can be taken from the Basin. These limits will be set based on the best available scientific knowledge and socio–economic analysis and cultural information. Identify, and seek to protect and restore, key environmental assets which are essential to the life of the rivers, their surrounding landscapes and the cultural values of the communities which depend on those water resources. Take into account the impact of this protection and restoration on individual communities, industries, regions and the wider economy. 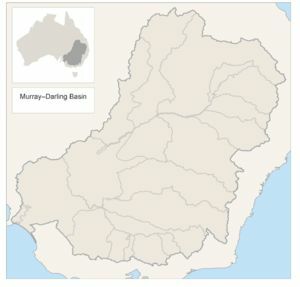 The Murray-Darling Basin covers 1,061,469 square kilometres or approximately one-seventh (14%) of the total area of Australia (7,692,024 square kilometres). Water use in the Murray-Darling Basin has soared 500 per cent in the 80 years up to 2010. This page was last modified 22:20, 24 October 2010.